In this video, I’m going to break down exactly how a title tag works when it comes to SEO. It’s a really important tag. It’s something you should really focus on optimizing because of the importance it has not just on the search results page but also implications for your website itself as well. I’m going to break down the best way to use the title tag for SEO purposes coming up. Hey, guys. Darren Taylor of thebigmarketer.co.uk here and my job is to teach you all about search engine marketing. If that’s up your street, you should consider subscribing to my channel today. Now, in this video, I’m going to break down a title tag and what it means for SEO and the implications it has of optimizing this properly. First of all, what is a title tag? The title tag is an HTML element that describes the title of a page. You often see this on the search results page as the blue clickable link. If you go into your web browser when you’re on your website, at the very top within your tab, the description of that tab is also the title tag. Again, it’s not an element of the page you see within your content, it’s an HTML element that’s interpreted by browsers and by the Google search results as well. Now you know what a title tag is and where it appears, how do you leverage it for your advantage when it comes to SEO? Well, first of all, the title tag is one of the most important on-page optimizations you can actually make. The first thing you need to do is your keyword research. Like many things SEO-wise, you need to understand what keywords within the market you operate that you want to target. That’s the first step you need to do. The second thing you need to do is optimize your title tag towards your target keywords. How do you do this? Well, first thing you need to do is put your primary keyword, the headline term you really want to show for, as early in the title tag as possible so that keyword has more importance. Then the next thing you want to do is find a secondary keyword that you would like to target and fit that within the title as well. First thing to notice as well is that you don’t stuff your title tag full of keywords. Not just a list of repeating keywords, it’s got to make grammatical sense, because it’s really going to help your website in the long run. Here’s why. 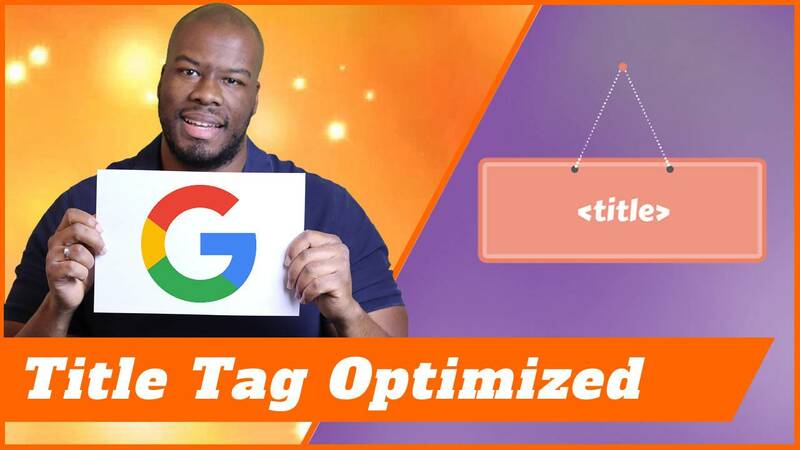 How exactly do you optimize your title tags in 2019? If you do go down the route of over optimizing your title tag, it’s going to have massive implications for you SEO-wise because it won’t make sense when the user reads it. If they go to the search results page, and look at the listings, and see your website listing doesn’t make sense grammatically, it’s not likely to get a click. The implications of that are that if you have a low click-through rate from the Google search results, it does affect your rankings negatively. You’ve got to make sure you get a good share of the clicks because your click-through rate is a great ranking factor you should want to optimize. It’s a balancing act. You’ve got to balance between putting keywords in your title and also making sure it’s an appealing clickable title. In fact, you should be treating your title tag like the headline of a PPC ad, it’s got to be appealing. There are also a couple of other things you should notice with the title tag as well. First of all, the length character-wise should be between 50 and 60 characters. Any longer and what will happen is Google will truncate your title tag therefore, the entire thing won’t show up on the search results. It will be truncated. It might not look right for the user when they’re reading the search results page. They’re looking through, they see your website, and they can’t finish the sentence you have with the title tag. That can be an issue as well. You want to make sure you stay within that character limit as well. There’s quite a few things to think about here. You’ve got the worry of adding your primary and secondary keywords into your title, you’ve got to make sure it’s readable, you’ve got to make sure it’s not stuffed full of keywords to make it spammy. All of these things as a balancing act are harder to optimize than some elements of SEO, which are pretty straightforward. Because of the importance of the title tag, take your time right, write it carefully, plan out what you want to do, work your keywords, and get help if you need to. If English language or whatever language you’re speaking isn’t your forte and it’s not the thing you’re known for or you’re good at, get some help with someone who can work your keywords in into your title tag and make it readable and appealing as well. There’s one other thing I should mention, and that’s something you hear a lot in the SEO world, and that is keywords are becoming less and less relevant. Yes, I know this. It’s something that I do see on a regular basis when it comes to updates from Google. However, I’ve done experiments of taking key words out of title tags, writing a really grammatically nice kind of advertorial title tag with no keyword density in it at all. When I’ve done these tests, I’ve found the one with the keywords in it performs better from a ranking perspective every single time. Google are going down the roots of artificial intelligence and using contextual learning and machine learning to understand what’s on a page without keywords, but it’s a long way from that point at the moment. Right now, you need to make sure you put your keywords into your title tag otherwise, you might struggle to rank. Another thing from a technical point of view, you don’t want to duplicate your title tags across your website. Every single page should have a unique title tag because if you have duplicate title tags, it can have negative implications for your SEO. What might happen is Google might not understand which page to choose from to rank so it just doesn’t pick in the first instance. This is also known as flux. You don’t want this to happen to your website so you’ve got to make sure every page has a clear focus. If you have a clear focus on every page and every page is pulling its weight in that fashion then you shouldn’t really have duplicate title tags anyway. Just make sure you don’t duplicate your title tags across your website. My final closing point is just to remember this, I can’t stress this enough and I’ve mentioned it already, you have to work your keywords into the title tag but write your title tag for humans not for Googlebots. Humans first. That’s the way to go when it comes to SEO. In the future, even if there are technical elements that might restrict that slightly that should always be the way you do things. Thank you guys so much for watching this video. If you liked it, please leave a like below. Let me know in the comments what you think you’re going to do with your title tags. I’ve also linked up some useful videos in the description as well when it comes to SEO. More important than that, don’t forget to subscribe. Check out the other content on my channel. I’ll see you guys on my next video.